CHRISTMAS IN JULY BLOG HOP!!!!!!!!! With All My Heart: CHRISTMAS IN JULY BLOG HOP!!!!!!!!! CHRISTMAS IN JULY BLOG HOP!!!!!!!!! Welcome to Scrap Our Stash Christmas in July Blog Hop!!!! If you didn't come here from Scrap our Stash blog, you need to go there, because it's where the fun starts!!!. 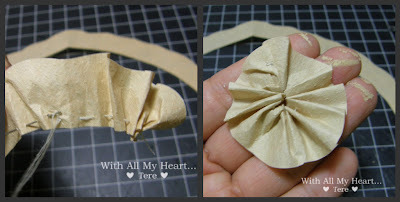 Plus you'll find there all the instructions you need for this fun blog hop! - Acrylic paints. I used cream and gold. - Liquid glue. I love Glossy Accents. 1. Paint the picture frame. I used 2 colors; cream as base and gold to give it a nice finish. 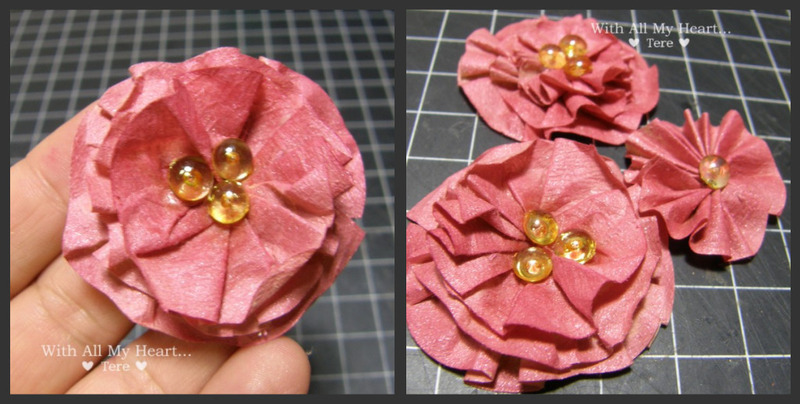 Let it dry completely, mean while you can work on the flowers. 2. These are the coffee filters we'll use. 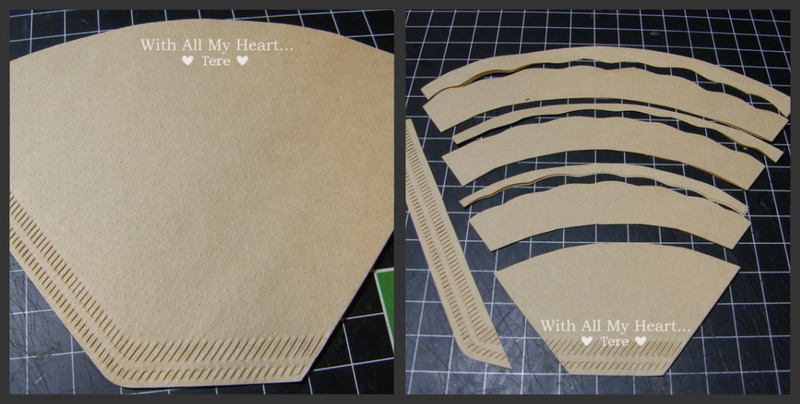 In the second picture; you can see the kind of cuts we need to make. It is optional if you want to make those wavy cuts, they can be straight. 3. These are the cuts we'll use to make the flowers. 4. The strips will look like this when you open them. 5. Make a running stitch on the bottom of each strip and pull it tight to gather together. It's like making a yo-yo flower but with paper. The second picture shows you how it looks like at the end. It's not looking pretty ...yet... just wait. 6. You need to make 3 yo-yos for each flower. Cut a circle, 1" approx. and glue down the first yo-yo. Still no pretty enough uh? 7. Glue down the other 2 yo-yos. After they are completely dried, crunch them a little bit, or a lot, depending on how you like them. 8. Using your favorite mists ( I used my own, you can find a post about them HERE! ), mist the flowers, I used a pretty red color, you know? a Christmas color. 9. To make them more Christmas looking, I added some Dew Drops, again, I used some I made. You'll find the tutorial HERE! Now they do look pretty.. what did I tell you? 10. 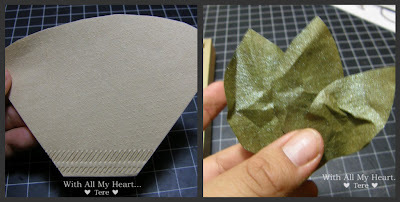 From the coffee filters left overs, I hand cut some leaves and misted them green. 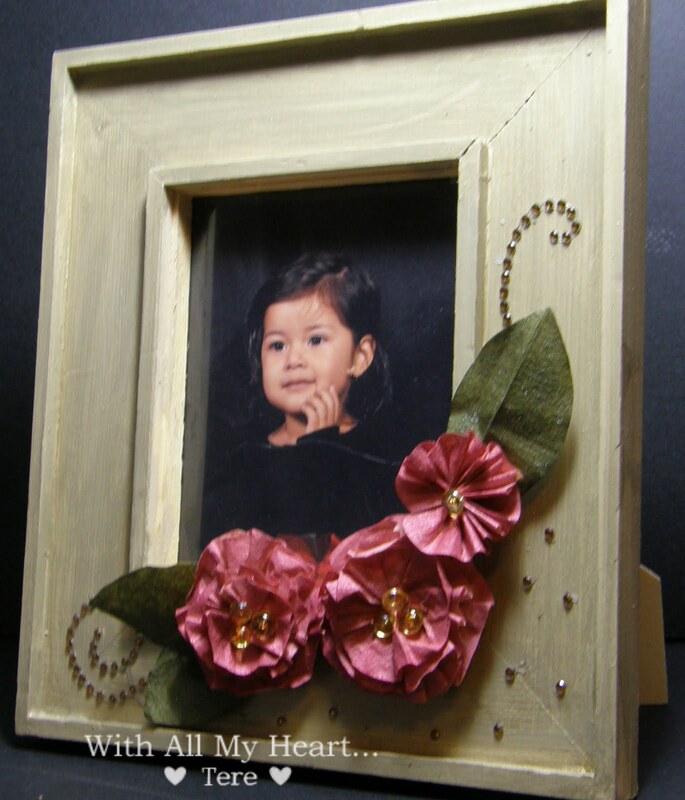 Get the dried frame, some bling from your stash and with your flowers and leaves, you are ready to decorate the frame. 11. Add a cute picture, like this one of my friend's daughter, and you'll have a beautiful decoration for this coming Christmas!!! As a thank you for participating and visiting my blog... I'll be giving away a $ 20.00 Gift Certificate from Two Peas to a lucky person. ... that's all you need to do!!!! 2. Hop to the next stop which is the blog of: Ren Yi! Thank You so much for participating... and happy hopping!!!! 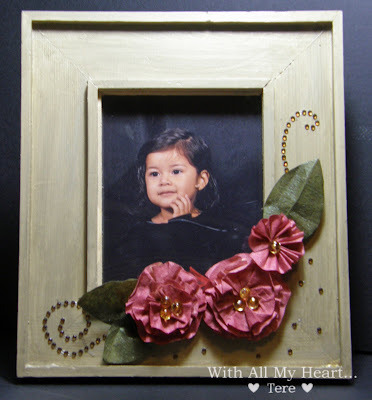 The frame turned out awesome--and thanks for the flower tutorial! I became a follower and a fan on fb! Love the frame and the flower. Thanks for the detailed instructions. I am now a follower of your blog and liked your facebook page. 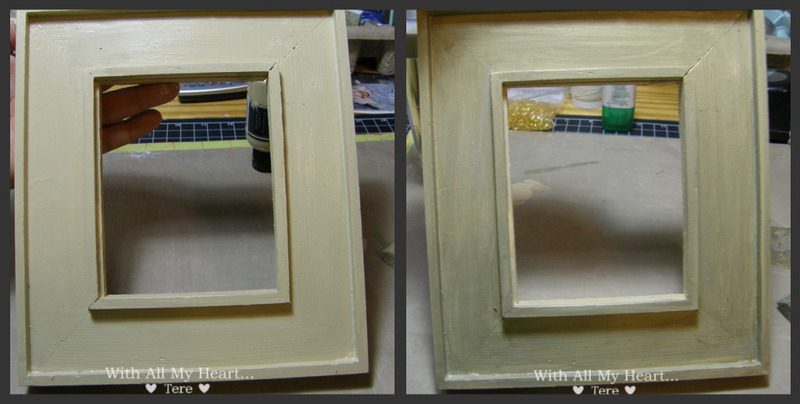 Great picture frame Tere! What a great Christmas present idea! Beautiful frame! Thanks for the easy to follow directions on making this awesome project. Oh I love this idea! I am going to have to do this! Thank you for the inspiration! I love this idea and will be using it for gifts in the future! I am following your blog now! What a great way to make flowers and that frame is gorgeous! Muy hermoso. ¡Adoro las flores! Love the colors you use for frame! 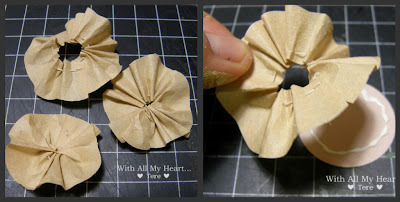 I would never thought to use coffee filter to make flower. I will have to try that. Became ur follower! thanks. OMG!!!! Love the Flower!!!! So Great and really adds to the frame! Thanks for the great idea! I'm a follower now! I LIKE!! y no entendi mucho lo q escirbiste , mas me dijieron las fotos jajaja, ahora me voy al traductor! Wow - will be making those flowers this afternoon - thanks so much! Hi Tere...that frame is GOR-GEOUS!!! Great tutorial on the flowers...gonna have to try that!! 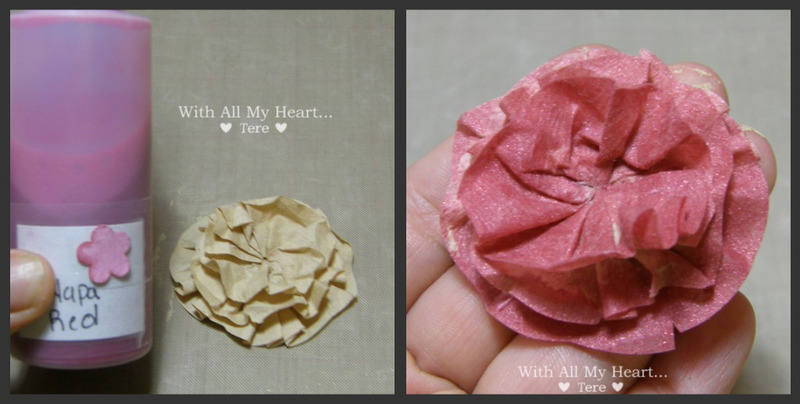 I love it Tere and it is so beautiful! I would love to try but would you guide me step by step over the phone?? (lol)!! No seriously it may happen! Tere amiga.... Beautiful... Love the tutorial.. See u around let me keep hopping !!! Tere - those flowers are just wonderful. thanks so much for showing a tutorial. 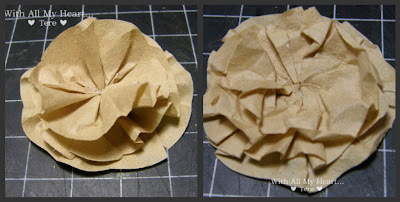 i always wanted to know what to do with the way too many coffee filters i have! What a cute frame! Love it! What a neat project! It would make such a greta gift! Q belleza de trabajo, el tuto esta muy bueno, y las fotos estan de alta calidad. Buen trabajo amiga - como siempre !